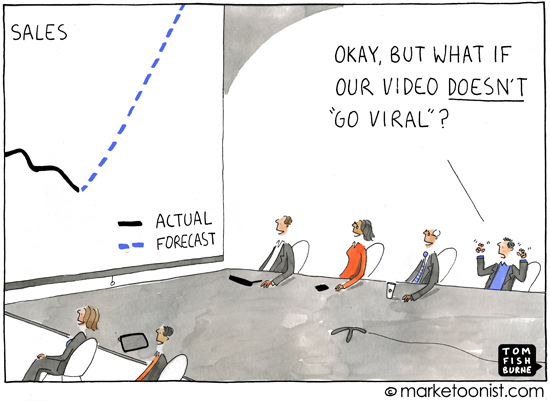 “Go Viral” by Tom Fishburne. The problem I have encountered often recently is that many people seem to have various misconceptions about what ‘viral’ really is, what it really means – but mostly how easy (read: difficult) it is. I hit the web and spoke to some friends and colleagues in the industry and uncovered quite a few myths and legends concerning viral products and viral marketing. Here are a few virality mythbusters for the next time someone turns up at your door asking you to “just make your product go viral”. Virality is only including the ability to share stuff to social networks from within your product. The ability to share content to social networks from within applications is just expected functionality these days. True and proper “virality” for social apps is not just letting your users share objects out of your product (although it helps). Apps that successfully use a viral engine of growth build the core interactions around the need or desire to involve your friends in the product experience. In other words, it’s not about broadcasting your status to your friends: it’s about using the product together with your friends. Some classic examples of apps that have gotten this nailed are Words with Friends or Farmville. Virality is automatically posting everything that happens within an app to the user’s facebook wall or twitter feed. No, this is just annoying. If the Facebook news feed logic doesn’t start blocking your updates, your user’s friends certainly will. Sure, some early products made it big by spamming their user’s facebook feeds, but this just doesn’t work anymore. A clever, witty and funny message (ideally with a kitten) will automatically “go viral”. The reality is that most attempts to create something witty with the specific intention of making it “go viral” will fall flat. People are smarter than that, and they know when someone’s trying to play them. A notable example is when Ashanti thought it would be a neat idea to support her new album by creating a viral campaign that let people send their friends death threats. No further comment necessary! “Making it go viral” should not be the goal. Viral is the outcome of a great piece of content that successfully engages users. Sharing the first link on your facebook wall and Twitter feed is enough to start the avalanche. Nope. Viral messages need to be seeded properly. It’s all about momentum. If it takes too long to get started, it will die out before it reaches its peak. Properly seeded viral messages start by getting spread by people with many thousands of followers… not the 250 people on your personal twitter post. Serious marketers also pay big dollars to seed messages. In fact, social media agencies measure return on investment (ROI) on social campaigns by how many views a message gets relative to how much cash they spend to seed it. Now, don’t get me wrong: clearly when you an everyone in your team tweet and post and blog about your product or message, it can only help. In fact, I view it as a very important activity for the whole team to be a part of… but the point is, it’s (probably) not going to result in a million views overnight. If we make a product video and upload it to YouTube, our marketing work is done… YouTube will do the rest. Over 72 hours of video are uploaded to YouTube every minute. Yes, every minute. However, some research has indicated that less than 1% of videos get more than 5,000 views in a year. YouTube is a crowded, cluttered space, and not every video is going to stand out, and you’re going to need to do a little more than just upload it to YouTube and hope for the best. Here’s an example: the official Nokia YouTube channel has, at the time of writing, 635 videos uploaded. Of that, only 22 videos (3.5%) have more than 1 million views, and only two videos have more than 5 million. And of those 22 with more than a million views, only five videos are less than 12 months old. Compare that with some classic examples of viral successes, such as this Evian commercial, which has over 58 million views. Clearly, a lot of varied content helps raise the overall number of views (109 million aggregated views for the whole Nokia channel), this total is not the result of one silver bullet-style viral video, and it wasn’t achieved overnight. Social media is a powerful set of tools to allow you to reach unprecedented numbers of people. But if your message is not compelling and engaging, then people won’t engage with your message. Just like the fascination (and the birth and massive growth of an entire industry) surrounding Search Engine Optimisation (SEO), you can try to play the system, but at the end of the day if your content is not compelling, the tricks won’t help you… at least not long-term. People share content that they care about and that is meaningful for them. Something “going viral” is the result; it should not be the goal. This entry was posted in Product Design, Product Management and tagged myths, viral, viral marketing, virality. Bookmark the permalink.